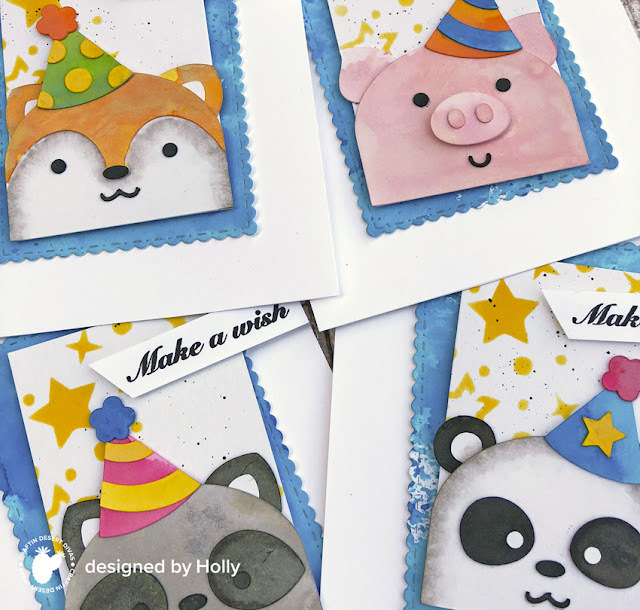 Hollybeary Creations : Craftin Desert Divas Creative Challenge!! Craftin Desert Divas Creative Challenge!! It's time for a new Creative Challenge at Craftin Desert Divas... This week the team was challenged to create dimension with SVG's and Die cuts. 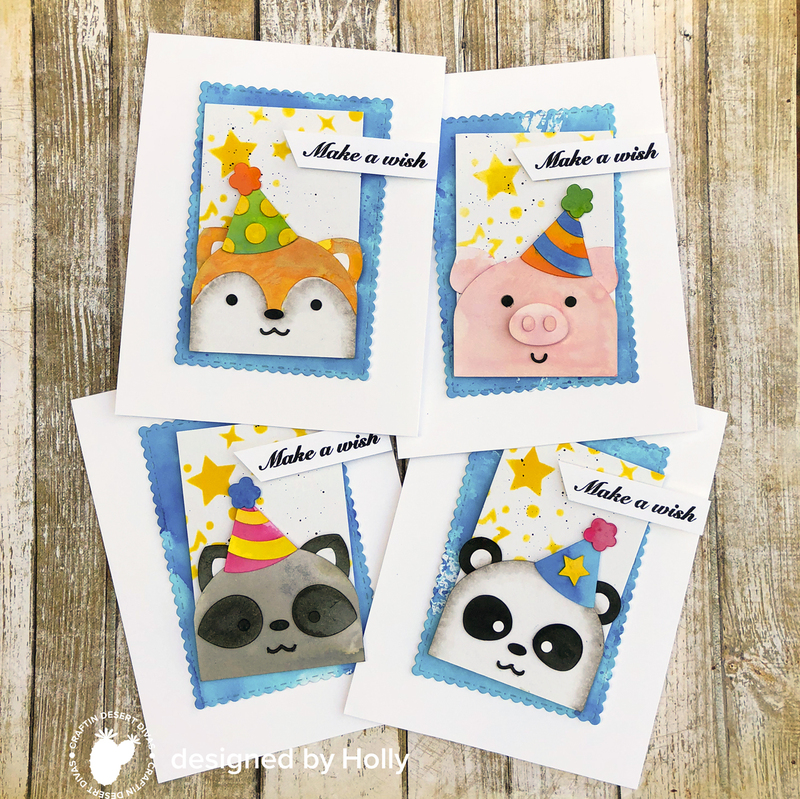 I used the new Birthday Critters SVG Treat Bag Add-on file with the Fancy Frames Die set for a fun set of Birthday cards. I cut all the pieces from some Bristol paper using the SVG file and my Silhouette machine. Then I added color to all the pieces with some Distress Oxide Inks. I smoosh the ink onto a craft Mat and then I spritz the ink with water and lay the paper into the ink. You get messy fingers but it's so fun to color this way and you get such different results each time. I then cut some rectangles to use behind the faces from some additional Bristol and added some stars with the Star Galaxy Stencil. I die cut the smaller rectangle from the Fancy Frames die and added some Salty Ocean Distress Oxide ink to it as well. I created 4 Top folding A 2 size card bases and adhered the Blue rectangle directly onto them. Then I adhered the rectangle with the stars off-centered with some foam tape. I assembled all the pieces to create the animal faces and then I adhered them to the White Rectangle. I stamped the sentiment from the Magical Unicorns stamp set onto some White cardstock and trimmed it into a banner. I adhered them over the edge with some foam tape. These took a few hours but all the work was well worth it... They are adorable!! Head over the Craftin Desert Diva Blog for more inspiration from the team!